Health professionals say they are stepping up efforts to see alcohol minimum pricing in place in Scotland, with a seminar being held in Brussels. Scottish Health Action on Alcohol Problems (SHAAP) will speak at the event, which will explore Scotland's alcohol policies, on 5 September. Legislation to introduce a minimum unit price of 50p north of the border, was passed at Holyrood in 2012. But a legal challenge to the policy has been referred to a European court. A group led by the Scotch Whisky Association (SWA) and other European wine and spirits producers mounted a legal challenge to the Scottish government's plans, arguing that minimum pricing legislation breaches European law. The SWA's legal bid was initially rejected by judge Lord Doherty at the Court of Session in Edinburgh last year. Following an appeal hearing, judges at the court referred the case against the policy to the Court of Justice of the European Union. Scottish ministers have said they are committed to introducing the policy in a bid to address the country's unhealthy relationship with drink. SHAAP - a partnership of the Scottish Medical Royal Colleges and Faculties and the Royal College of Nursing - has hit out at what is sees as "the continued opposition by global alcohol producers to the implementation of Scotland's alcohol minimum unit pricing (MUP) policy". Initiatives in place seem to be working - alcohol-related harms and deaths have been falling in Scotland for many years. SHAAP said written opinions from EU member states may be made to the European Court, with the deadline for this being mid-October. Representatives of the body will head to Brussels to "make the case for health" at the seminar. The organisation will be joined by industry supporters of the policy, including C&C Group and the Scottish Licensed Trade Association (SLTA). SHAAP director Eric Carlin said: "We need other member states and the Commission to support or at least not oppose the Scottish policy. "MUP (minimum unit pricing) is opposed by a consortium of multi-national alcohol producers who, inaccurately, are framing this as a health v industry issue. "Demonstrating the falseness of this claim, we have speakers from the Scottish alcohol industry who support this policy from an ethical position." Dr Peter Rice, chair of the body, said a 10% increase in average minimum price in Canada was associated with a 32% drop in alcohol death rates. 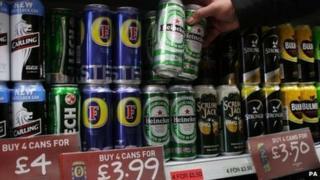 "Changes in the price of alcohol are a key determinant in rates of alcohol harm," he said. "This vitally important health policy will save Scottish lives and it needs to be implemented as a matter of urgency." Paul Waterson, chief executive of the Scottish Licensed Trade Association, said: "The SLTA is delighted to be involved in this very important seminar exploring Scotland's innovative alcohol policies. "We fully support the most inventive of these, minimum unit pricing, and believe it to be a crucial element in trying to change Scotland's uneasy relationship with alcohol." SWA spokeswoman Rosemary Gallagher, said: "Initiatives in place seem to be working - alcohol-related harms and deaths have been falling in Scotland for many years. "It's important to debate the issues to identify the best ways to address the problem of alcohol misuse. "It's therefore unfortunate that SHAAP continues to call for minimum unit pricing, the legality of which is being considered by the European Court, rather than focusing on steps that have been shown to be effective."